In 1976 Gerald Ainscough started the Wigan based Ainscough Crane Hire company and since 1984 has been run by his three sons Martin, James and Brendan, employing 1,000+ people and a national network of 25depots, which hosted 500 cranes. Thanks to seven years of aggressive acquisitions it became by far the UK's largest crane hire operator. In 2007 Ainscough Crane Hire, the UKs market leader in crane hire, announced the £255m sale of the business to the existing management team, funded by an integrated debt and equity package from Bank of Scotland Integrated Finance. In 2001 Ainscough Training demerged from Ainscough Crane Hire and became a standalone company. 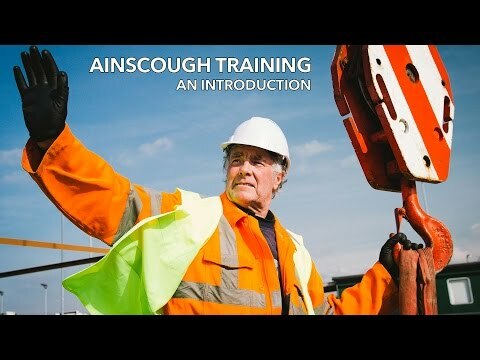 Visit www.ainscoughgroup.com to access more history regarding Brendan Anscough and Ainscough Crane Hire, where Ainscough Training began. Since this demerger Ainscough Training Services Ltd have gone from strength to strength and this demerger allowed us not only to train many of the candidates from Ainscough Crane Hire, but expand our service across the UK and abroad. Since then, vast improvements have been made to our facilities; we moved from a remote porta cabin style, to a state of the art bespoke, environmentally friendly training facility that offers our clients a professional and welcoming learning environment. In our ever changing world, we realise the need to communicate with our customers in many different ways; with that in mind, we are constantly improving the customer experience on our website, giving customers an easy to navigate site with the vital information they need to make an informed decision about their training. In 2013 we developed our site further to be mobile responsive and now nearly 50% of our customers visit us via their mobiles. We regularly communicate with our customers via social media; including Twitter & Facebook, helping customers meet the faces and personalities that are Ainscough Training Services Ltd. Most importantly, getting out and meeting our customers is essential for us to understand our client's needs. In 2013 we started attending the Verikal Days Exhibition; this is the fastest growing Lifting and Access event in Europe and has been held at Haydock Park in St Helens. The history of the Ainscough name is entrenched with helping charities and Ainscough Training Services continues this support. We regularly support charities important to the business, the local area and our employees, such as Help for Heroes, Wigan Youth Zone, Princes Trust, Whizz Kids and many more. We strive to identify funding opportunities for our customers and in 2012 we were successfully approved for our military customers to use the Enhanced Learning Credits (ELCAS), this was subsequently followed by our approval by Career Transition Partnership (CTP) in March 2014. Through ELCAS, ex-military personnel can have up to 80% of their courses funded through the enhanced learning credits. We can also help guide ex - military through resettlement process. In 2015 on the back of the Vehicle Banksman course becoming a new CPCS category we have just launched the A73 CPCS Plant & Vehicle Marshaller and due to client demand we have now invested in an additional crane a Liebherr LTM 1030-2 30t all Terrain Crane.